What is Outsourcing for NFPs? What is Outsourcing for Nonprofit Organizations? When a nonprofit outsources their accounting to Qbix Accounting Solutions, they pay a monthly fee (usually less than the cost of a full-time employee) and receives a done-for-you accounting service. Outsourcing is the new best practice – How did this happen? When you’re not a lawyer, it’s hard to hire and build a legal department. When you’re not a CPA, it’s hard to hire and build an accounting department – even assuming the necessary candidate with the necessary talent is available. You’re not alone – whether a nonprofit organization, a start-up, or a small business – it’s extremely difficult to build departments beyond the domain expertise of the organization. It’s also expensive. And there’s another problem. When there’s turnover in a small department (often a staff of one) all the history and departmental knowledge leaves the organization when the employee walks out the door. In the for profit world, start-up companies were very susceptible to the costly disruption within critical functions that were staffed by one or two people. CEOs, boards and venture capital companies looked for a better model and soon it became clear that the smoothest path to fast growth and meeting strategic goals was outsourcing functional areas such as Accounting, Legal, Human Resources, Information Technology, etc. What does that have to do with nonprofit organizations? Savvy Executive Directors have looked at the outsourcing model and determined that outsourcing is the most economical path to mission fulfillment. “I wish I would have outsourced years ago,” is a sentiment we hear all the time. Consistent access to timely and accurate data helps Executive Directors better executive their vision and strategy. Outsourcing nonprofit accounting dramatically ratchets up the level of professional attention your books and reporting receive – you have an entire Qbix team working on your behalf. It’s a team of multiple individual with varying skill sets (we’re not going to charge you CFO pricing for tasks that can be handled by a bookkeeper). 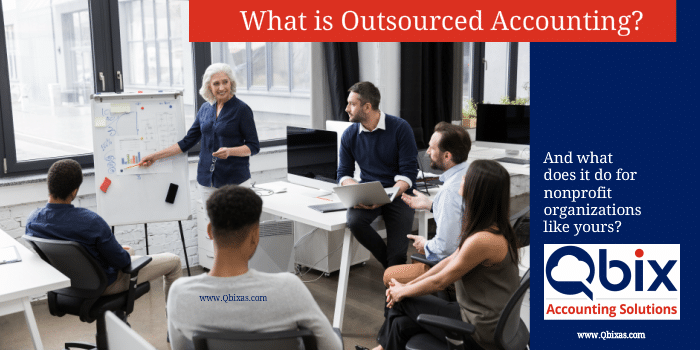 I’ll be focusing on Outsourced Accounting for Nonprofits with a more in-depth look covered in a series of videos – but very briefly outsourcing your accounting is much more than, “Here’s how we do things, now you do it”. For every prospective client, we first seek to understand the nuts and bolts of your organization. We then take this information and help you completely rethink how you are doing things in order to provide a more efficient accounting operation while providing more timely and better information for your management team.